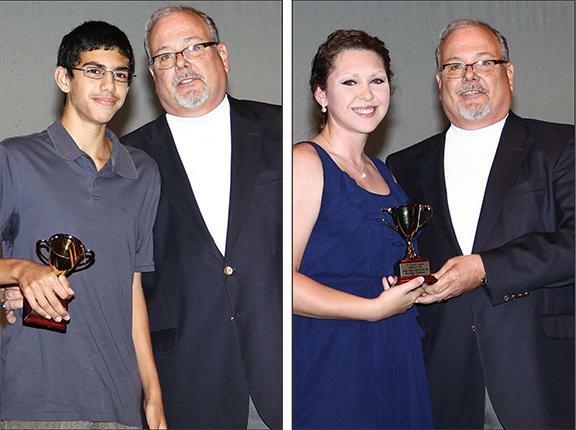 Umar Rasul and Rebekah Faulkner won the Publisher's Cup at the Courier Hall of Fame banquet. Time management is not an issue for Rebekah Faulkner and Umar Rasul. The two Cannon County High School standouts were named the Cannon Courier’s Publisher’s Cup winners as the Lions’ top scholar athletes in 2013-14. The award was presented during the fourth Cannon Courier Hall of Fame and All Sports Banquet at The Arts Center of Cannon County Thursday (May 15). Rasul, a four-year member of the cross-country and soccer teams, is Cannon County’s Salutatorian. Faulkner, a four-year member of the volleyball and girls basketball teams, ranked third in Cannon County’s Class of 2014. She is the top female graduate in the class. Faulkner was a strong factor in Cannon County’s run to the TSSAA Class AA State Tournament in 2014. She earned All-District Tournament honors and was a second-team All-District 8-AA selection. Faulkner thrived in her senior season. The strong-willed post turned in numerous double doubles and was a workhorse in the paint. Faulkner will continue her career at Sewanee – The University of the South. Rasul is one of the top scholars in Cannon County and has options of attending Ivy League schools on academic scholarship. The personable Rasul was a charter member of the school’s cross-country team, and he has been a mainstay on the soccer field as a forward throughout his Lions’ career. Rasul never allowed his academics to take a back seat to extra-curricular activities.